Report shows Lapid has forbidden his party's MKs from signing support of presidential candidate, wants to control vote for female candidate. 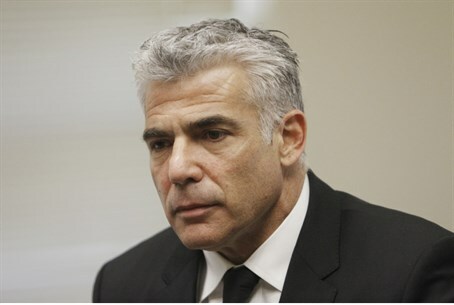 Yesh Atid Chairman Yair Lapid has forbidden MKs in his party from signing their support for any presidential candidate, so as to be able to control which candidate his party will throw its weight behind. The signature of ten MKs is need for a candidate to be in the running. The move brings to mind Lapid's erstwhile ally Jewish Home Chairman Naftali Bennett's accusations of Yesh Atid as a "dictatorship," given the party's lack of primaries. According to Maariv, Lapid's party is trying to find a female candidate to put in the running; one name that has come forward is that of Professor Ruth Arnon, leader of the research that developed Copaxone, Teva Pharmaceutical's medicine for multiple sclerosis. "We have a built-in sympathy for women, and wanted to find a different kind of female candidate for the position," revealed an unnamed senior member of the party. "A candidate different from the set list of names. Lapid didn't want MKs to obligate themselves in advance to any candidate, to leave him an opening to suddenly surprise with an interesting and unique name for the presidency." Another female candidate has already thrown her hat in the ring. Dalia Dorner, president of the Israeli Press Council and retired Supreme Court Justice, announced Thursday she would be running, saying "the fact that there is a female candidate gives a boost to women, and therefore I decided to give an affirmative answer." A poll published Friday morning revealed 72% of Israelis want the decision of appointing the president to be in their hands, and not in the hands of the MKs. The poll also found 63% of the public want the presidential institution to remain, despite a recent bill to cancel the position. Some of Lapid's decisions last week have raised have raised suspicions of "dictatorship," including the cutting off of funding to Judea and Samaria following the claims by a far-left journalist that government funds were going to the region's Yesha Council. Lapid also leaped on a loophole to retroactively cancel February funding for all yeshivas, a move that sparked massive hareidi protests.